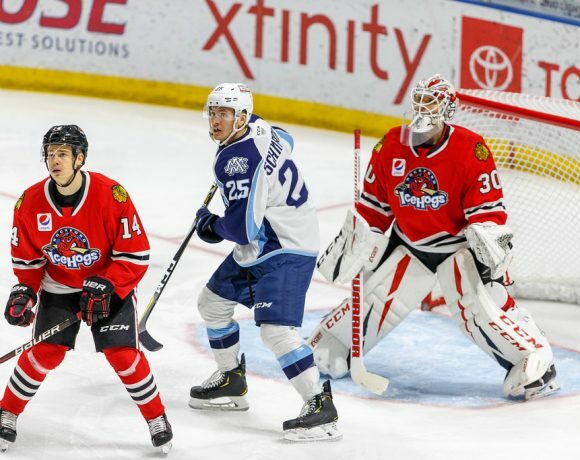 The Rockford IceHogs squad that returns to action at the BMO Harris Bank Center is going to look a little different than the team that hit the road a couple of weeks ago. The Blackhawks AHL affiliate had some roster changes over the course of a six-game road trip. Several of those players factored into what was a pretty successful jaunt away from home. Rockford fared pretty well on the trip, winning three of the games and picking up points in two others. This week, the Hogs split a pair with Cleveland before dropping Saturday’s game with Grand Rapids. Considering some roster turnover and two rookie net-minders, the results were heartening. Those rookie goalies stepped up and played well in this week’s games. Colin Delia has a 2.40 GAA and a .925 save percentage in his last four starts. Matt Tomkins picked up his first AHL victory Friday night in Cleveland, stopping 32 of 35 shots to beat the Monsters. Currently, the IceHogs (22-16-2-3) are still in third place in the Central Division, just behind Iowa, just ahead of Milwaukee and even with Chicago. The four teams are nip and tuck for the second through fifth spots in the division. Defensively, Rockford has a very different look with the additions of Cody Franson and Adam Clendening. John Hayden adds a more physical dimension to the forward lines. All three players have figured into the scoring column since joining the team. 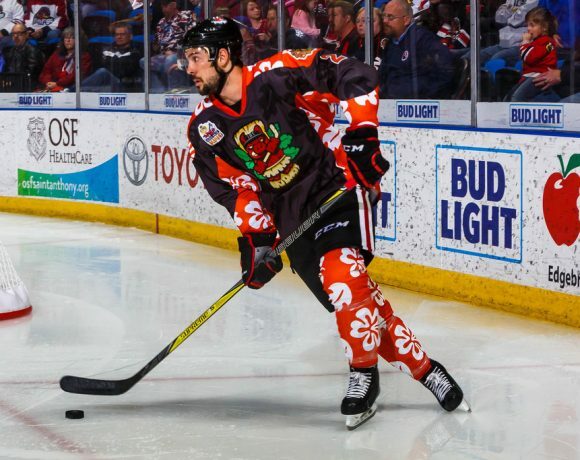 Clendening has assists in three of the five games he’s spent in his second tour with Rockford. He has moved onto the Hogs power play unit, which scored twice in four chances this week. Clendening should fit right into the fast-paced style coach Jeremy Colliton wants to play. Franson has taken a leadership role with this young group of skaters. He seems to be commanding the respect of his teammates. The 6’5″ Franson also forms a lengthy blue line tandem with 6’9″ Viktor Svedberg. Hayden has certainly made an impact around the net, with five points (2 G, 3 A) in the six games he’s spent with Rockford since Chicago sent him down. Hayden will benefit from an bigger role with the IceHogs; Rockford should also see positive returns. The addition of Forsling gives Rockford the following defensemen on the roster: Forsling, Franson, Clendening, Svedberg, Ville Pokka, Carl Dahlstrom, Robin Norell, Luc Snuggerud, and Darren Raddysh. Eight of those players are on NHL contracts with the Blackhawks (Raddysh being on an AHL deal). Norell has been skating as a forward in the last several games, otherwise he’d be firmly seated in the team box. Snuggerud is nearing a return from an injury and needs playing time. The Hawks didn’t send Forsling down to sit. How is Colliton going to divvy up the minutes? Raddysh would appear to be the odd man out if the roster remains as is. I wouldn’t be surprised to see him sent to Indy…unless another defenseman is moved in a trade. That seems more plausible than Chicago recalling someone to be an eighth defenseman. I wouldn’t expect to see this situation linger for too long. Franson is looking for a spot on an NHL roster. Clendening is well traveled. Svedberg and Pokka could be throw-ins to a deadline deal. Hey, maybe Norell gets a extended look up front (though I don’t see the benefit of such a move). The IceHogs rallied from a pair down but saw a big overtime chance pass them by and left the second point on the table. Still, Rockford stretched its point streak to six games. The Hogs opened the scoring 5:45 into the game when Graham Knott turned a broken play into his second goal of the season. As he brought a puck out of the defensive zone, Viktor Svedberg had fired a pass that didn’t connect with the rookie forward. However, the puck came off the right half boards and slid into Monsters territory and toward the crease. Knott caught up to the loose puck and got a shot on net. Cleveland goalie Matiss Kivelnieks made the stop but the rebound glanced off of Monters defenseman Garret Cockerill and into the goal. Cleveland tied the game late in the opening period on a Zac Dalpe goal, then took a 3-1 advantage in the first half of the sandwich stanza. Dalpe struck again, this time on the power play at the 9:03 mark. Brady Austin then provided the two-goal lead when his floater got by Rockford goalie Colin Delia. Rockford closed to within a goal late in the period. Tanner Kero got the play started by swiping a puck on the fore check. He got the turnover to Anthoy Louis, who skated left to right before backhanding a top shelf attempt past Kivelnieks at 18:08. The IceHogs came up with the equalizer 8:45 into the third when Luke Johnson finished off a nice bit of hustle by Hayden. The former Yale captain got a stick on an attempted outlet pass by Kivelnieks and followed the block behind the net. Flipping the puck to the left post, Johnson was on hand to tap it past the Cleveland goalie, making it 3-3. The score remained tied through the end of regulation. Rockford had a tremendous chance when Monsters defenseman Dean Kukan fell down in Gus Macker Time. Louis and William Pelletier came down the ice with only Kivlenieks between them and a win. Louis got a return pass from Pelletier and had a wide open net. Unfortunately for Rockford, Louis was nearly past the net when he got the puck. His attempt to complete the tough-angle shot was wide and this game would be decided by a shootout. Dalpe converted for Cleveland in the first round, Louis for the Hogs in the second. It took an extra round to settle the matter after Alex Broadhurst and Svedberg were stopped in round three. Terry Broadhurst got a puck by Delia that would give the second point to the Monsters. The Hogs did not have a power play opportunity tonight. This may be the first time I’ve had to write this. Again, the Hogs had to dig themselves out of a two-goal hole. Three marks in the final 20 minutes did the trick, giving Rockford the victory over the Monsters. Cameron Gaunce took advantage of a broken play by the Monsters, banging in a loose puck in the slot to put Cleveland up 1-0 9:43 into the first period. Just 24 seconds into the middle frame, Terry Broadhurst picked the pocket of Adam Clendening and sprung Zac Dalpe on a 2-on-1. Dalpe kept the puck and fired past Hogs goal tender Matt Tomkins to make it 2-0 Monsters. After being badly outplayed in the opening 20 minutes, Rockford got down to the business of getting back in the contest. The power play got things started. Clendening slid a pass to the stick of Cody Franson, who one-timed the puck to the net. Cleveland goalie Matiss Kivlenieks made the initial save, but Andrea Martinsen was in front of the net to finish the scoring play at the 7:11 mark. 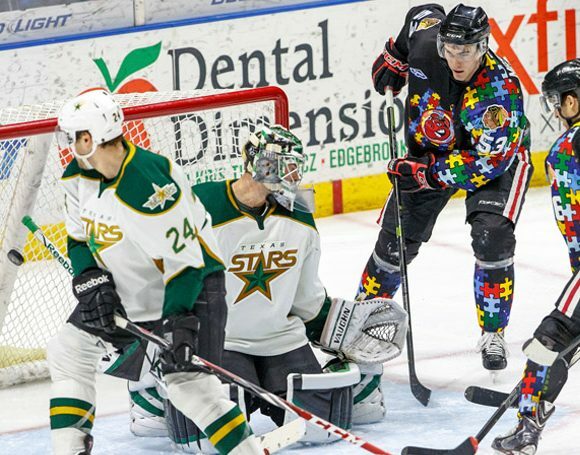 The IceHogs rally kicked into full gear in the third. John Hayden took an entry pass from Matthew Highmore down the left halfboards, into the corner and back up the boards. He was at the outside hash marks of the left circle when he turned and fired on net. Highmore was there for the screen, allowing the shot to sneak by Kivlenieks and draw Rockford even 6:38 into the final frame. Hayden returned the favor to Highmore a few minutes later. Entering the Cleveland zone, Hayden backhanded the puck behind him to Highmore at the top of the left circle. Highmore’s aim was true and The Hogs had a 3-2 advantage at the 11:16 mark. The Monsters yanked Kivlenieks with just under three minutes to play for an extra skater. In clearing a puck from the Rockford zone, William Pelletier’s backhanded fling caromed off the boards for a long-distance empty-netter that made it 4-2 with 2:19 to play. Alex Broadhurst potted a 6-on-5 goal 17 seconds later, but that was as close as Cleveland could get. 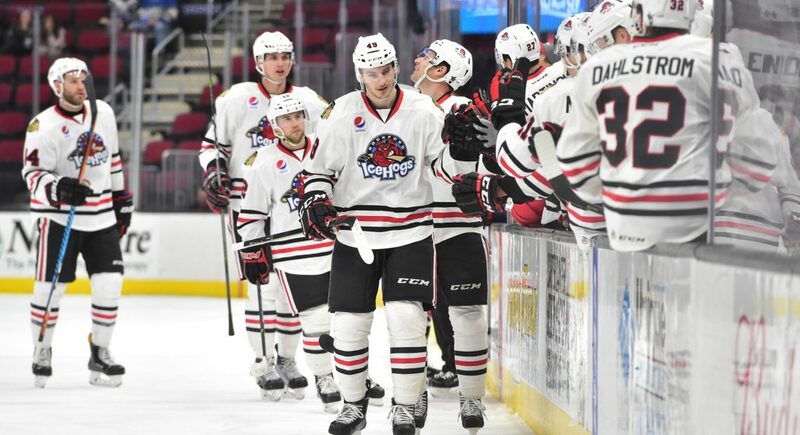 The IceHogs posted the win, stretching their point streak to seven games. Tomkins got his first AHL victory, making 32 saves to do so. Highmore nabbed the game’s First Star honors, while Gaunce and Martinsen rounded out the top three. The end of the road trip saw the only regulation loss for Rockford. As has been the case throughout the season, the Hogs kept at Grand Rapids even when trailing by a pair late. Getting a point at Van Andel Arena just wasn’t in the cards on this night, though. The IceHogs got an early power play when Anthony Louis was taken down by Turner Elson in the opening minute. John Hayden got a behind the net feed by Tyler Sikura and got the puck by Griffins goalie Jared Coreau at the 1:22 mark. Grand Rapids quickly answered with a Eric Tangradi tally 14 seconds later. The action was back and forth, though neither club could break the tie in the opening 20 minutes. The action remained even through most of the second period until Matt Peumpel struck for the Griffins while on the man advantage. His goal at 17:39 gave Grand Rapids a 2-1 lead heading into the second intermission. Rockford tied the game 4:21 into the third on Tanner Kero’s redirect of an Adam Clendening shot. The elation was short-lived, however. Dominic Shine restored the Griffins advantage 21 seconds later to go up 3-2. A couple minutes later in 4-on-4 action, Robbie Russo found himself wide open in the slot. Taking his sweet time, Russo made it 4-2 Grand Rapids at the 7:26 mark. The Hogs continued to battle and got within a goal in the last minute. This time, it was Tyler Sikura getting a stick on a Clendening blast to make it 4-3 with 38 seconds remaining. Time ran out on Rockford, however, snapping a seven-game point streak and ending the road trip on a losing note. Rockford will host two of the California teams the Hogs visited two weeks hence. Bakersfield comes to the BMO on Tuesday night, while the annual Pink In The Rink game will be against Ontario Friday night. The IceHogs dropped their game against the Condors in Gus Macker Time by a score of 3-2. Ty Rattie is a potent AHL scorer; he had a late equalizer in regulation in that contest and potted the game-winner as well. Rattie has 16 goals and 13 apples to pace Bakersfield this season. Grayson Downing, who Rockford fans have seen plenty while he was with Iowa, had a three-point night in the Condor’s win. Bakersfield is at the bottom of the Pacific Division, though that didn’t prevent them from knocking off the IceHogs January 13. Rockford bested Ontario 5-2 back on January 10, paced by William Pelletier’s hat trick. The Reign have won four of their last five games, including a weekend sweep of Stockton. Park Ridge native Michael Mersch is Ontario’s active leading scorer (14 G, 14 A), while NHL veteran Matt Moulson has six goals and 20 helpers in 20 games with the Reign. Saturday night sees Rockford back at Van Andel Arena for another division game with Grand Rapids. The Griffins, winners of seven of their last ten games, have won the previous two contests between the teams. Follow me @JonFromi for thoughts on the IceHogs all season long.